Katie of Wellness Mama wanted to make recipe for a magnesium infused body butter that could also be used as a mild sunscreen/tanning cream. Magnesium helps with the absorption of Vitamin D. The result is this all-natural body butter with moisturizing ingredients that make the skin soft. Very simple recipe. It’s good for mild sun exposure, and sore muscles. From Nature with Love carries a HUGE selection of high-quality, health-related products. 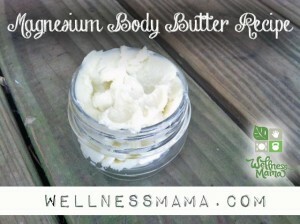 Click the How to Make Magnesium Body Butter link below to see the recipe.